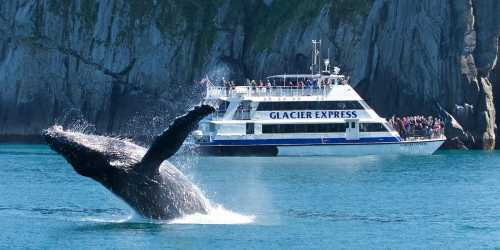 Experience the glaciers and wildlife of Kenai Fjords National Park and Resurrection Bay on a full or half-day cruise with Major Marine Tours. See wildlife such as humpback whales, orca whales, Dall’s porpoises, sea otters, Steller sea lions, puffins and many species of seabirds. Marvel at massive tidewater glaciers and witness calving, where large chunks of ice break off and crash into the water. With 7 cruise options to choose from, we have the cruise for you: from half-day family-friendly cruises on large, stable catamarans to full-day small-vessel adventure cruises. Most cruises are narrated by on-board National Park Ranger and feature an optional Alaska salmon and prime rib buffet, freshly prepared on-board and served while you cruise. Kids can take part in the fun and education Junior Ranger Program. Cruises depart early-March through mid-October from Seward.